Seed parent brachycaulos. D.Cathcart ? From BCR ... "Mature rosette to 25cms. diameter x 12cms. high, inflorescence to 10cms. 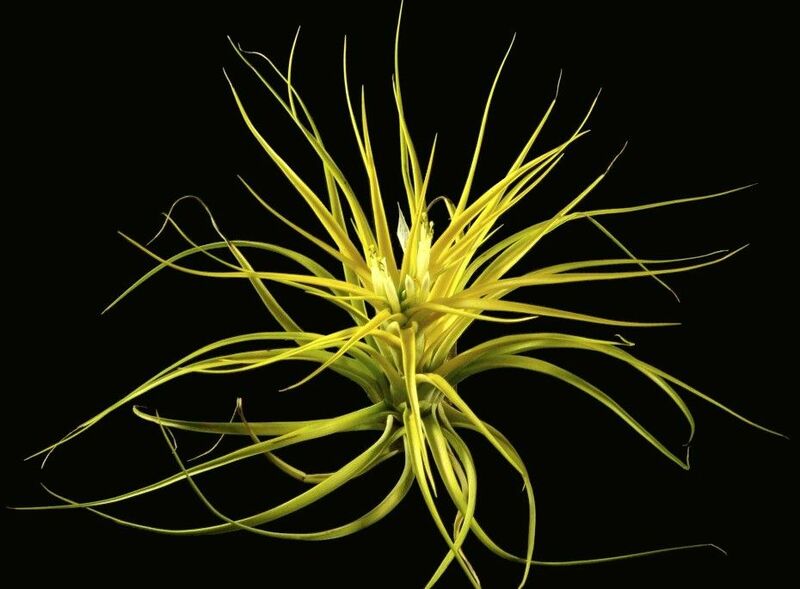 A rare colour form of T. brachycaulos which centrally blushes bright yellow instead of typically red, with white flowers instead of the usual purple. Wild-collected in Costa Rica circa 2002, but occurs occasionally in Guatemala also. 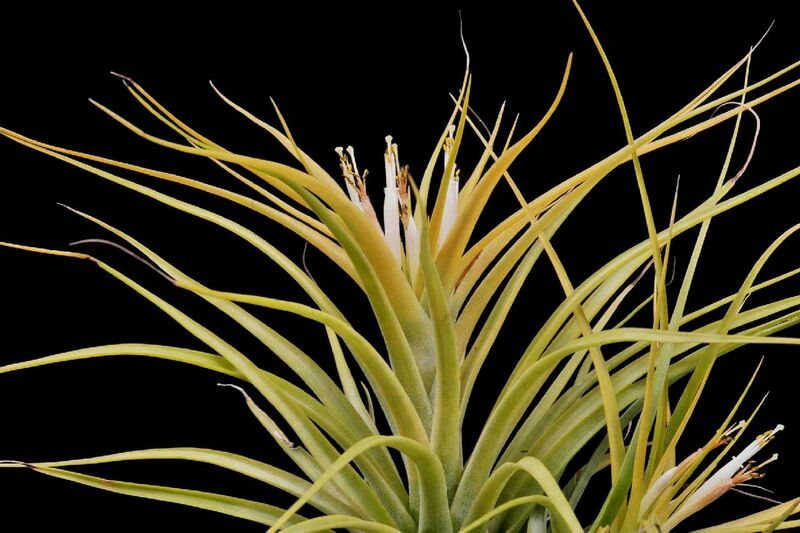 Country of origin: Costa Rica / USA"
Dennis Cathcart 10/08/11 ... "Registration: Tillandsia brachycaulos 'Sunglow' A rare form that blushes bright yellow instead of red, and has white flowers instead of purple. This form is similar in all aspects but coloration to the normal form. The measurements of a typical ‘Sunglow’ are: Half inch wide leaves, 10 inch spread, 5 inches high and a 4 inch inflorescence. Collected in Costa Rica about 2002. This color form also occurs rarely but occasionally in material from Guatemala as well. Tropiflora code #1559. Thanks, Dennis." Greg Aizlewood 05/02/15 ... "Not sure where this came from, maybe Pete or Dennis Cathcart. This is my first flowering but I notice it does not appear in the T. brachycaulis section on the disc. Maybe the label is incorrect? Any ideas please." Greg Aizlewood 05/02/15 ... "That's the one Derek, thanks. Unfortunately mine has now lost all the colour but I am confident that you are correct. My import list when I found it has the plant coming from Dennis in New Orleans under the name T. bracycaulis yellow but I will now change it to T. Sunglow which I believe is a cultivar name even though it was wild collected in Costa Rica. How does that work?" Peter Tristram 23/08/16 ... "I took these pics a few yrs back. The next generations have stacked on the leaves so I hope I am home when they bloom this summer. Original plants came from Tropiflora and I’d guess Dennis would have a stack by now and be flogging them world-wide (except to Aussies!). I have no idea of provenance and can’t remember the (any) answer when I asked in 2012. I have a feeling I saw pics posted on Tropiflora’s fb page a while back." Derek Butcher 24/08/16 ... "Looks great AND the plant/s are in Australia. Why don't you ask Dennis what name he is selling under and perhaps we can get it properly registered as a Cultivar." Peter Tristram 24/08/16 ... "Tropiflora are listing the plant (registered!) as ‘Sunglow’. 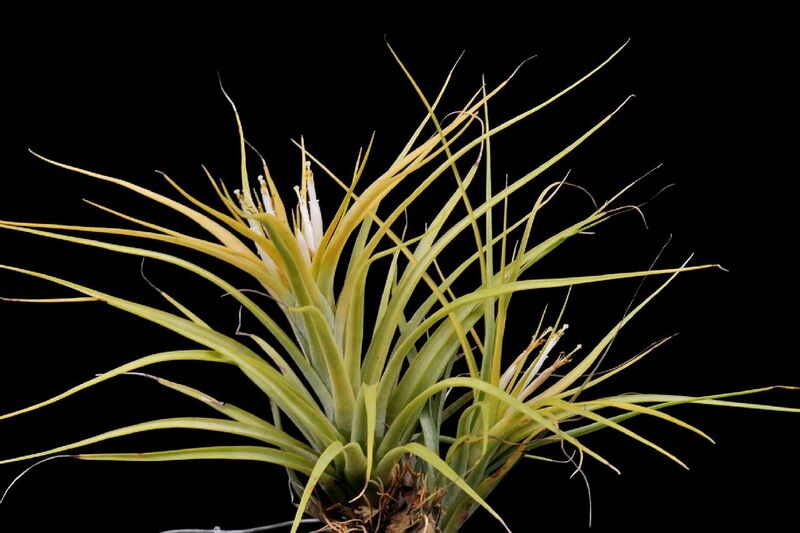 So owners of the rare (certainly in Oz) yellow brachycaulos, change the name to T. Sunglow and UD will be very happy! It’s really an ‘alba’ that hasn’t been formally written up. The BCR entry says it was collected in Costa Rica and also occurs in Guatemala but I wonder if the second bit was a guess."